Published seven years after his classic business book, The 7 Habits of Highly Successful People (1990), this book is a classic in its own right. Its underlying premise is that the behavior patterns that make people successful in business are fundamental; they make people successful in their families as well. Covey should know. He had nine children, and after reading the book I’m convinced he consciously practiced the seven habits in his own family. Be proactive – Become an agent of change in your own family. Begin with the end in mind – Develop a family mission statement. Put first things first – Make family a priority in a turbulent world. Think “win-win” – Move from “me” to “we”. Seek first to understand..then to be understood – Solve family problems through empathic communication. Synergize – Build family unity through celebrating differences. Sharpen the saw – Renew the family spirit through traditions. Throughout, Covey illustrates the seven habits with stories and examples from his own family. Are there other “habits” for parents and families besides these seven? Of course. Are there other vital communication skills besides empathic listening and conflict resolution? Absolutely. But the wholesome guidance in this book is 100% right-headed and it’s a great place to start – a wonderful recipe for purposeful, conscious parenting. 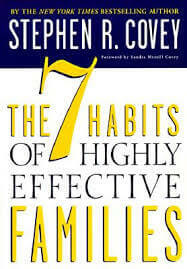 In my opinion, The 7 Habits of Highly Effective Families is one of the top ten parenting books of all time.